The online version of this article ( https://doi.org/10.1186/s13227-019-0121-x) contains supplementary material, which is available to authorized users. In addition to sexual reproduction and embryogenesis, a significant number of metazoan species are able to propagate asexually or regenerate completely and form new bodies through non-embryonic development (NED) [1, 2, 3]. Many species of tunicates, the sister group of vertebrates , are capable of asexual development and whole body regeneration . Tunicates include solitary species, which can only reproduce sexually, and colonial species that, in addition to sexual reproduction, are also able to propagate asexually and have extensive regenerative capabilities [5, 6, 7]. In tunicates, asexual reproduction and whole body regeneration occur by clonal replication whereby somatic tissues undergo a budding process that leads to the development of clonally related zooids. Current hypotheses for the phylogeny of the tunicates suggest many convergent acquisitions of NED across the whole subphylum [8, 9, 10], a view further supported by the diversity of tunicate budding modes. In fact, mechanisms of asexual development differ substantially among colonial species and involve differences in the body region where new buds appear, and differences in the types of cells and tissues that contribute to the development of new zooids [11, 12, 13, 14, 15]. Diversity in budding mode likely contributes to the wide variation in colony organization and integration among zooids found across the subphylum . 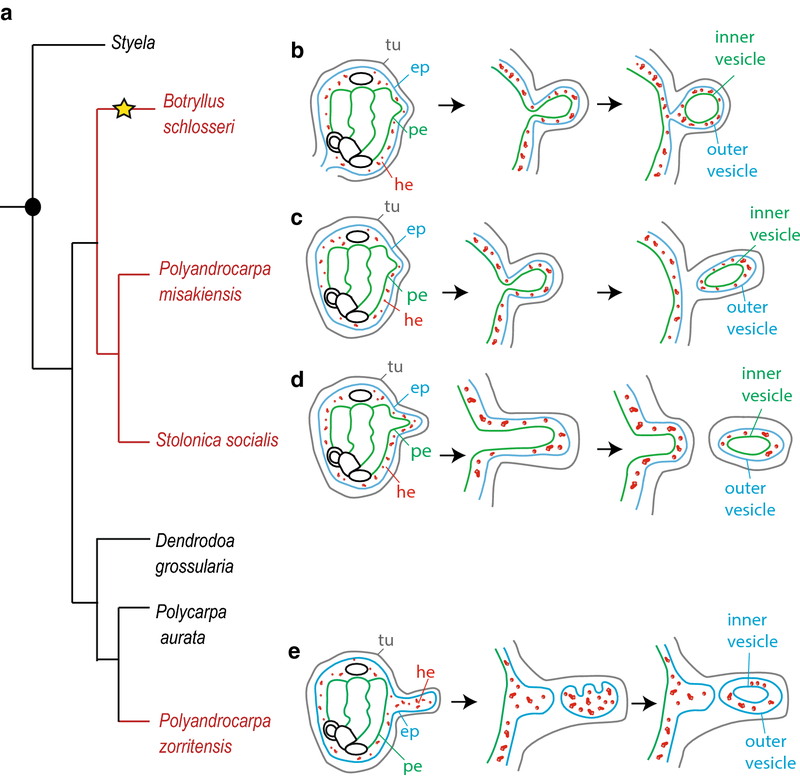 In order to dissect the mechanisms of budding in ascidians and to understand the acquisition and loss of complex characters such as asexual propagation and whole body regeneration, it is necessary to broaden our knowledge of budding modes among different species, and to compare them in a phylogenetic perspective relying on robust trees. Most of our current knowledge of tunicate NED comes from a limited range of species. One of the most well-studied colonial ascidians belongs to the family Styelidae, Botryllus schlosseri (Pallas 1776). In this species, the bud originates from an evagination and thickening of two epithelia, the peribranchial epithelium and the surrounding epidermis, with the possible participation of mesenchymal cells . The evagination arches progressively to form a double vesicle (Fig. 1): the outer vesicle derives from the adult epidermis and gives rise to the epidermis of the new zooid, while the inner vesicle derives from the peribranchial epithelium and undergoes morphogenetic changes that eventually give rise to the internal organs of the functional new zooid. Circulating mesenchymal cells aggregate within the folding epithelium and proliferate, participating in the formation of the organs [18, 19, 20]. The resulting bud remains attached to the colony by a short peduncle. This mode of reproduction, called peribranchial budding or blastogenesis, permits colonial growth and periodic zooidal renewal. In the family Styelidae, peribranchial budding is the main form of asexual development, with some minor variations between species (Fig. 1). For instance, in Polyandrocarpa misakiensis , mesenchymal cells are thought to transdifferentiate and integrate into the inner vesicle and the evaginated bud separates from the parent [22, 23]. In Stolonica socialis (Hartmeyer 1903), the atrial epithelium and epidermis protrude and extend considerably from the zooid body forming a process called a stolon . When the tip of the stolon reaches a certain mass, it is constricted off forming a bud disconnected from the maternal zooid . Studies of two different NED modes in Botryllus schlosseri, peribranchial and vascular budding, show that the double vesicle stage exhibits the first spatial segregation of cell fate domains, notably for ectodermal and endodermal identities [33, 34, 35]. During vasal budding, the tissue differentiation and the organogenesis also start from the double vesicle stage, wherein organ primordia appears as foldings of the inner vesicle . Therefore, it is possible that, despite the different onset, developmental modules responsible of the zooid morphogenesis are conserved in a convergently evolved NED. 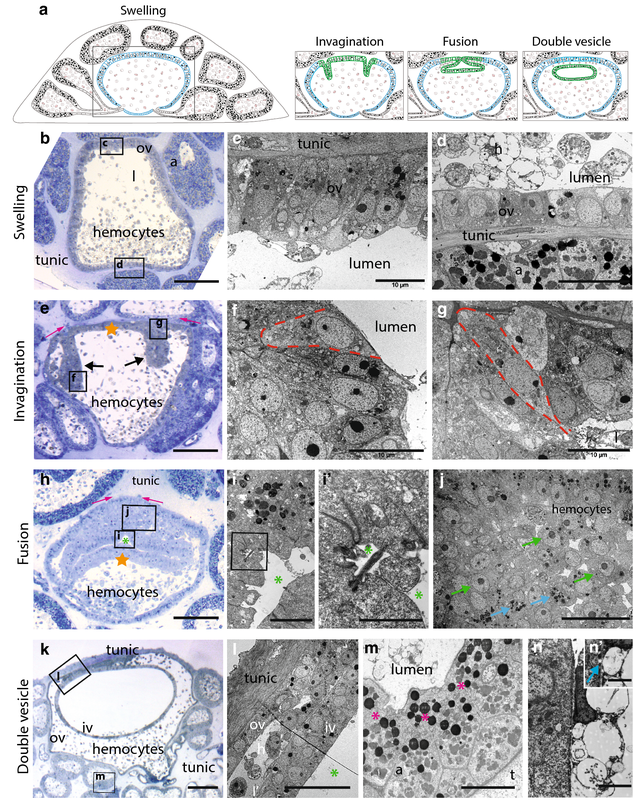 Among tunicate NED, various populations of differentiated hemocytes function as reserve cells, i.e., they supply nutrients at the onset of budding and during bud growth [25, 42, 43]. 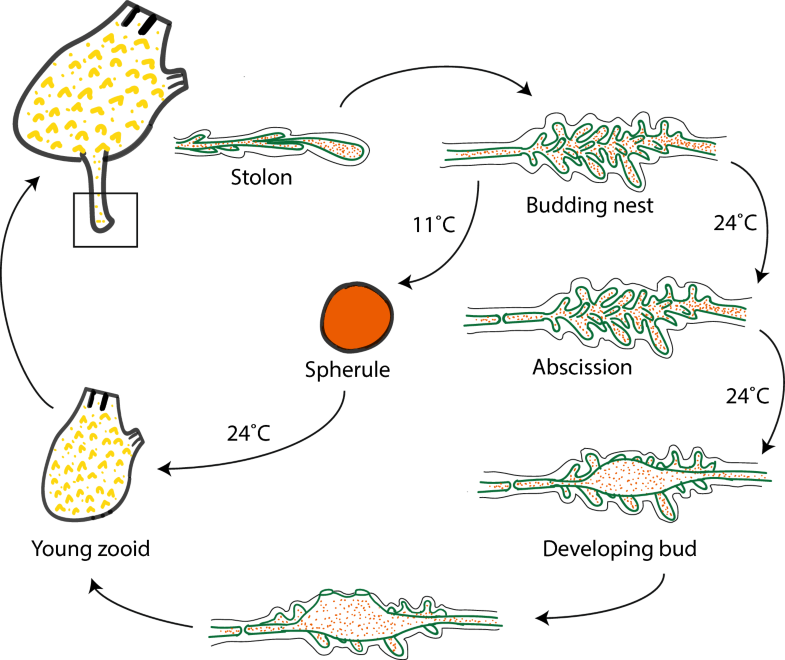 Although not functionally tested, this metabolic role of nourishing a bud physically and physiologically separated from the parental zooid has been documented in many species across the three major ascidian taxa, e.g., in trophocyte accumulation in winter stolons of Clavelina , in strobilated buds of Polyclinidae  and in winter buds of Stolonica socialis and Distomus variolosus . 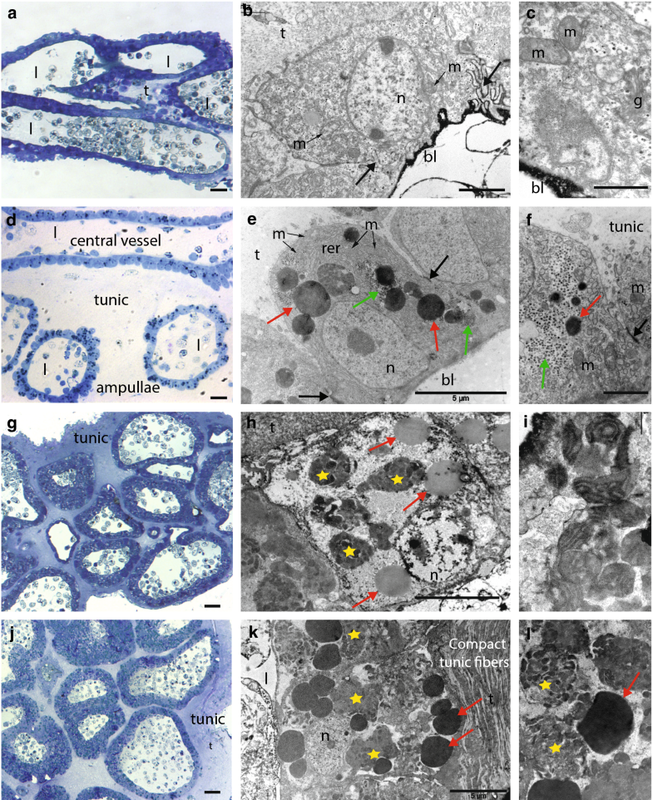 In P. zorritensis, formation of the budding nest starts by a thickening of the ampullar epidermis that accumulates lipid and glycogen granules, together with amorphous membrane-free inclusions similar to lysosomal bodies described in other species [45, 46, 47, 48]. The lipid nature of the granules is confirmed by their gray color after methylene blue staining (Fig. 4 b)  as well as their electron density following osmium fixation (Fig. 3e, f) . Later during bud development, the membranes of these ampullar cells disintegrate, while they are in close contact with numerous hemocytes resembling morula cells [26, 51, 52]. Morula cells have been proposed as cytotoxic cells based on their phenoloxidase activity in different styelid species . Therefore, we suggest that during vasal budding, the energy may be stored in epidermal cells of the ampullae rather than in trophocytes or reserve hemocytes. This is accomplished by glycogen and lipid accumulation and by self-digestion of these epidermal cells that release nutrients to the hemocoel and eventually to the growing buds. Such a nutritive function of the bud epidermis and/or hemocytes has been convergently acquired in species whose buds are physically detached from their parental zooids [24, 25, 31, 45]. 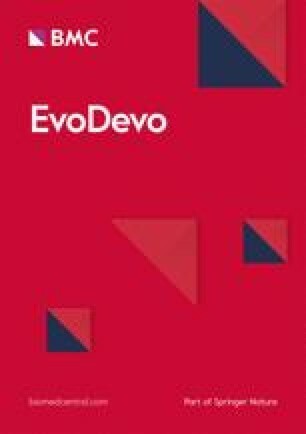 Molecular comparison of anabolic and catabolic pathways involved in nutrients accumulation and consumption may shed light on the mechanisms underlying this evolutionary convergence. Additional file 1: Fig. S1. Spherules at different degrees of transformation. Additional file 2: Fig. S2. Effect of low-temperature storage on rate of budding and stolon production. Additional file 3: Fig. S3. Relationship between the size of zooids and the size of spherules. Additional file 4: Movie 1. Tip of a stolon with mesenchymal circulating cells. Additional file 5: Fig. S4. 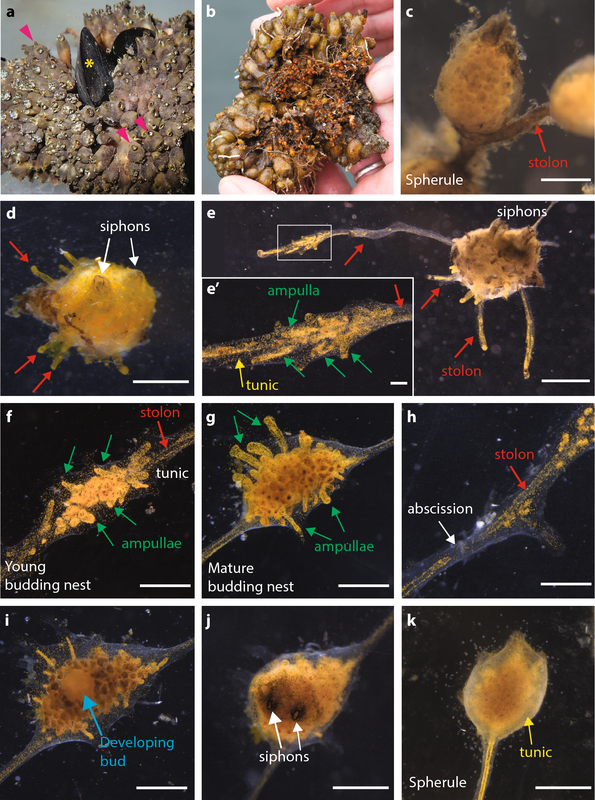 Relationship between the size of zooids and the size of budding nests. Additional file 6: Fig. S5. Details of a bud at stage 1, stage 2 and early bud organogenesis.